Lexi Thompson must feel a little bit cheated. 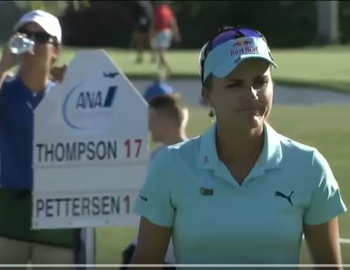 Over the weekend, the then-leader of the ANA Inspiration – one of the LPGA’s five Major Tournaments – was given a 4-stroke penalty on Sunday because of a viewer who emailed in a potential rules infraction they had seen on TV. The problem, the supposed infraction happened on Saturday and Thompson, who had already signed her scorecard, was unaware of any penalties while playing her final round. When the LPGA was informed of the violation, they reviewed it for accuracy and then immediately assessed Lexi with a 4-stroke penalty; 2-strokes for incorrect ball replacement and 2-strokes for signing an incorrect scorecard. Leading by three strokes at the time, Lexi asked "is this a joke" to the LPGA rules official. Fighting tears, confusion and frustration, Lexi went on to play some incredible golf only to end up losing in a playoff to So Yeon Ryu, and the golf world has been talking about this rules infraction ever since. Watch the video below to see the controversial rules infraction.